FLAT CROSSING, (Rail lines) NO POINTS NEEDED,SLOW AND EASY. ANOTHER WRONG UN, THIS IS NOT NOT WIDNES STATION, OR EVEN WIDNES SOUTH THE STATION IS WELL OUT OF PIC TO THE LEFT!! AND HAD 2 COVERED PLATFORMS THIS HAS NONE, NOT WIDNES SOUTH STATION UNTIL JANUARY 1959 ANOTHER ONE OF YOUR SEVEN WRONG PIN ID,s IN THE ONE PIC, AND MANY OTHER PICS. THIS IS PART OF WIDNES FOUNDRY, traveling crane and steel yard behind NOT A GIRLS Skoool, THE OTHER PIN IS BY SOME ONE WHO HAS 4 WRONG I.D.s IN THIS ONE PIC AGAIN AND UP TO SIX IN MANY OTHERS. AT THIS TIME IT WAS THE RELIEF OFFICE,NO DOLE, THEN,FAMILY ALLOWANCE, RENT, RATE REBATE, SICK PAY. WHAT IT WAS IN 1937 NOT AFTER WE ALL KNOW THAT. FOOT PATH, FROM ANN STREET EAST OR TRAFFIC LIGHTS ASHLEY WAY,AS NOW, GRT SHORT CUT DOWN HERE UP ON FOOT BRIDGE OF AT SPIKE ISLAND TO TOW PATH, OVER FOOT BRIDGE IN TO SANKEY STREET,OR FURTHER ON UP THE STEPS, OVER FOOT BRIDGE AND OUT IN TO SHORT STREET, WATERLOO ROAD, AS OF THEN. FOOT BRIDGE LATER SHORTENED TO HERE (WHEN SIDING REMOVED) ALFORDE STREET, ANN STREET EAST 50s ? STEPS UP TO FOOT BRIDGE, FOOT BRIDGE FROM HERE TO RAIL SWING BRIDGE ON TO SPIKE ISLAND, AS THEN 1937( LONGEST FOOT BRIDGE RECORD?? ) LATER SHORTENED SEE OTHER PIN. ANN'S STREET EAST LEVEL CROSSING, AND FOOT BRIDGE BEHIND, AS THEN. ANOTHER WRONG UN, NOT WIDNES SOUTH UN TILL JANUARY 1959 IT'S WIDNES STATION!!!! WHAT IT IS ON THE DATE OF THE PHOTO TAKEN NOT 20 ODD YRS LATER . 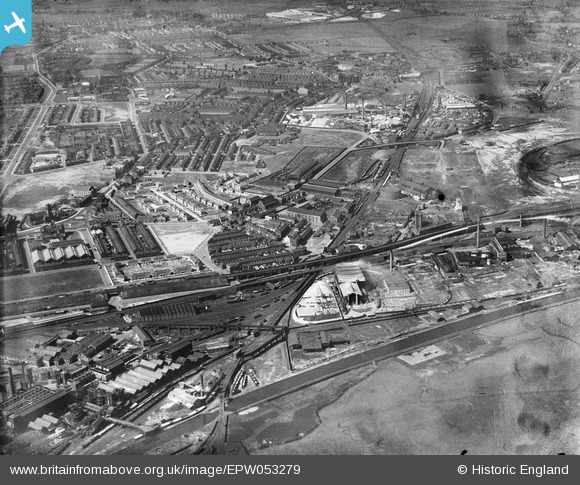 THIS IS PART OF WIDNES FOUNDRY, traveling crane and steel yard behind NOT A GIRLS Skoool, AND NOT St MARIES. The St. Helens canal- "The Cut"